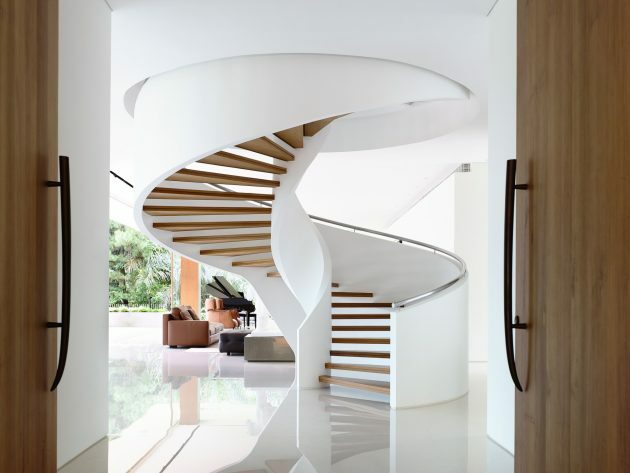 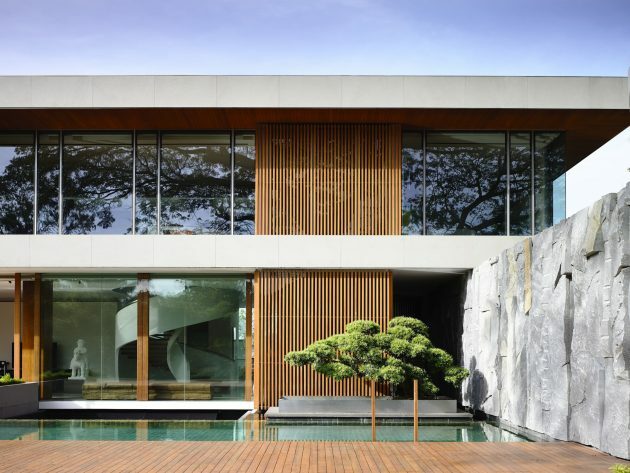 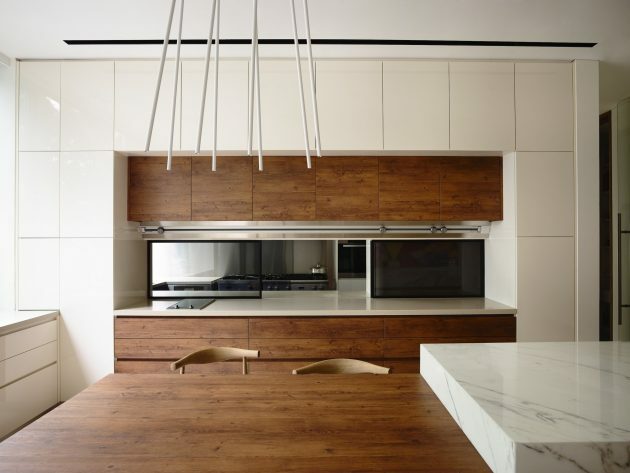 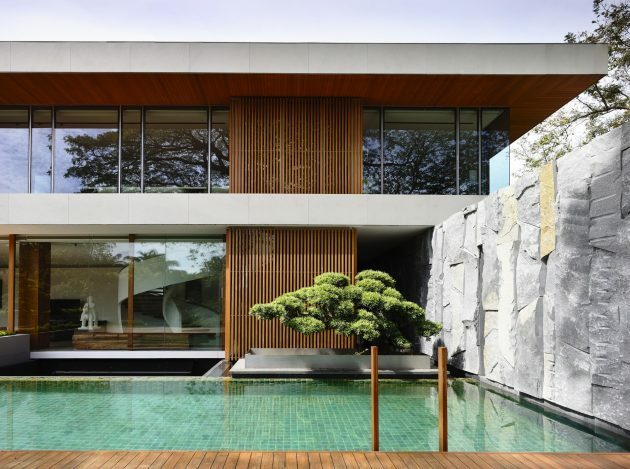 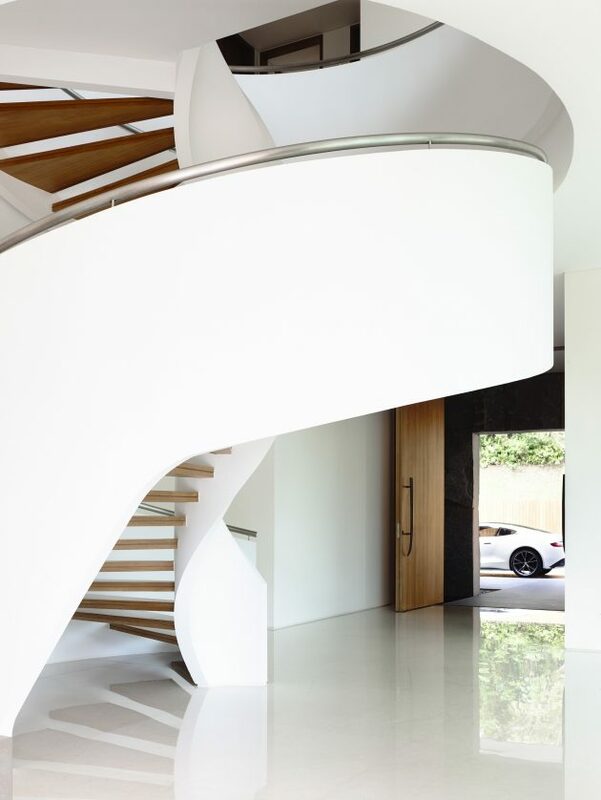 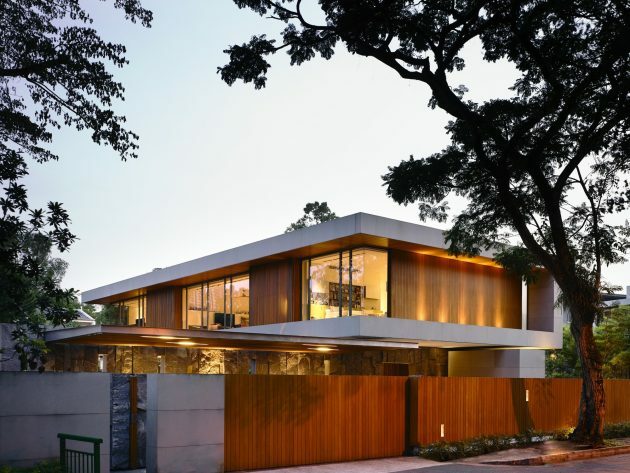 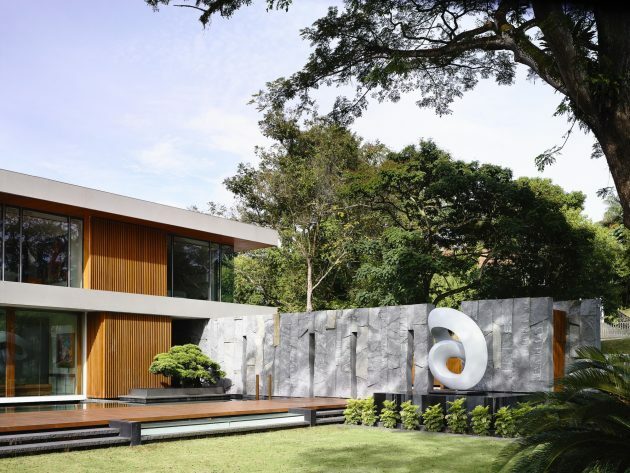 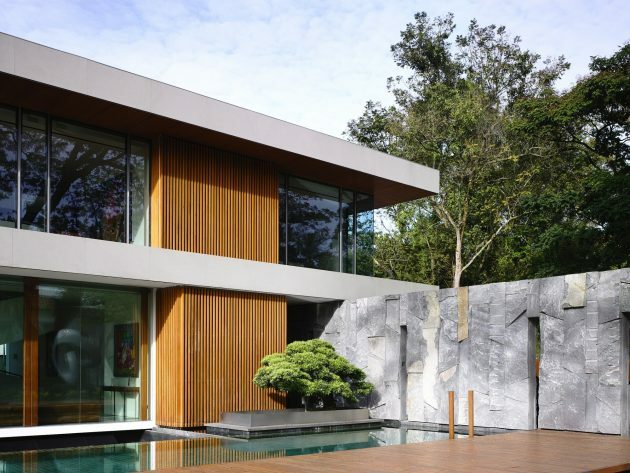 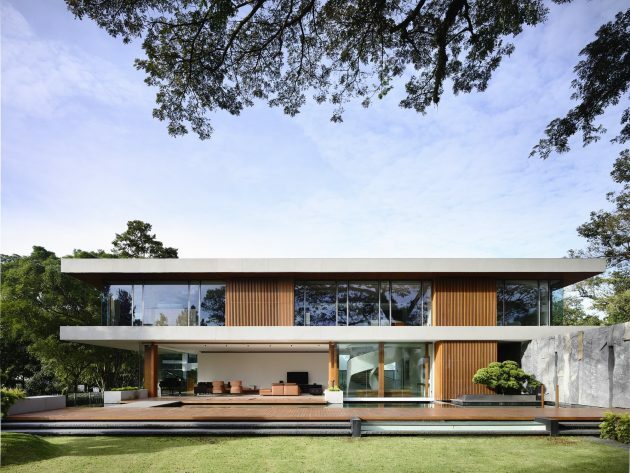 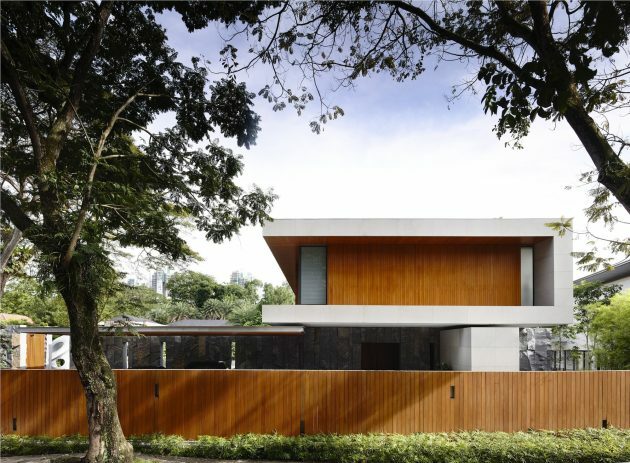 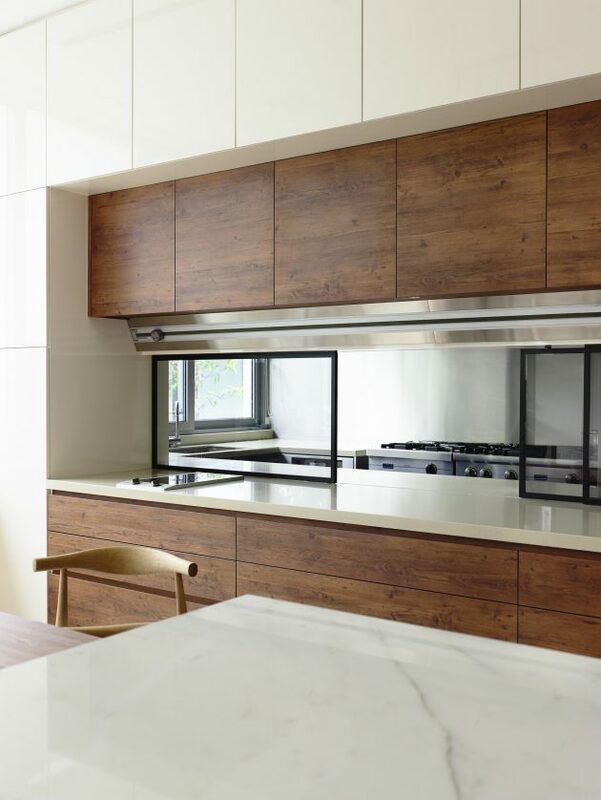 The 65BTP-House is a contemporary design by ONG&ONG Pte Ltd in Singapore. 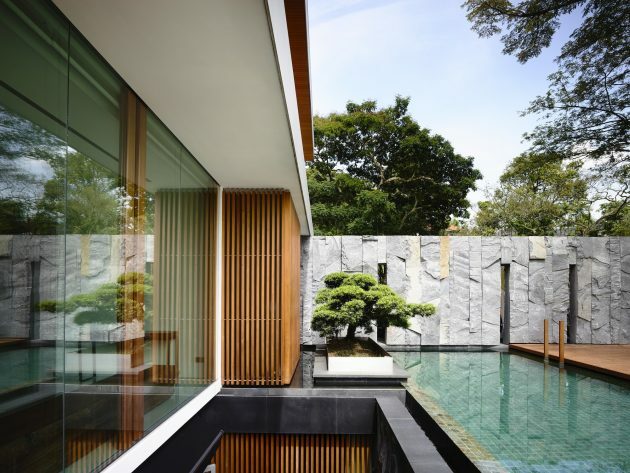 This private residence is surrounded by a vast garden that gives the luminous interior a nice backdrop. 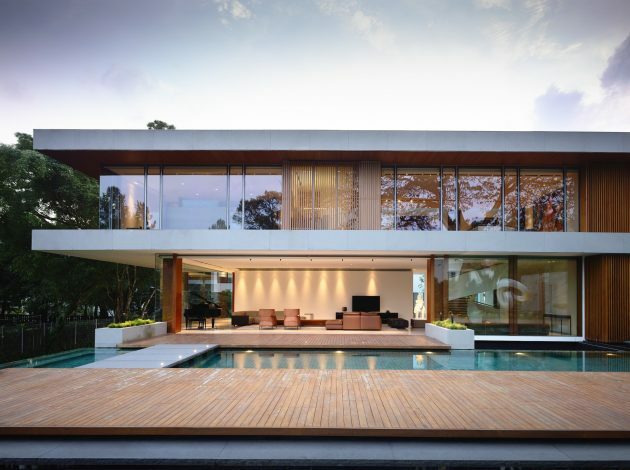 The layout of the interior is mostly designed as an open plan and it is showered in natural light thanks to the large windows on both floors. 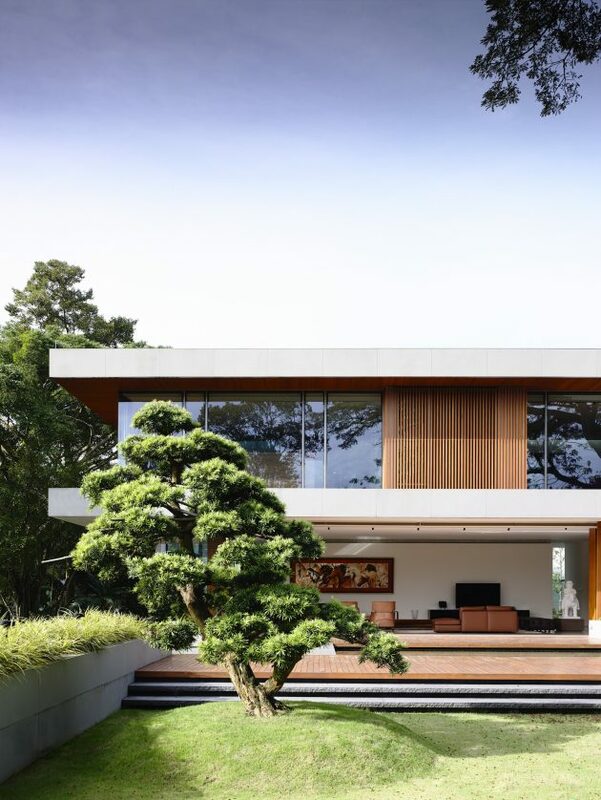 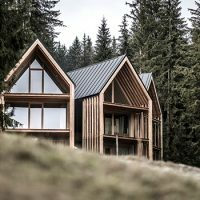 The ground floor is connected to the natural surroundings of this home through sliding glass doors. 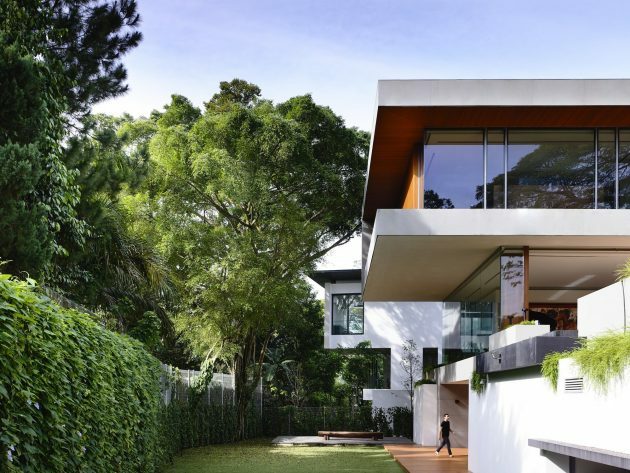 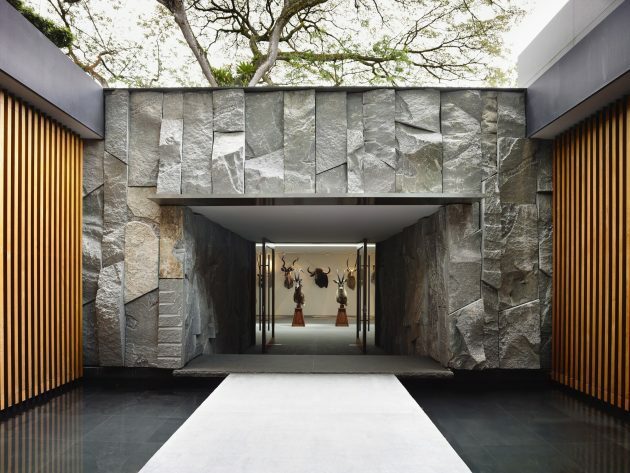 This is a home surrounded by a vast garden that converges at a colossal pre-war rain tree with such magnificence that its presence is ingrained within the very architecture of the house itself. 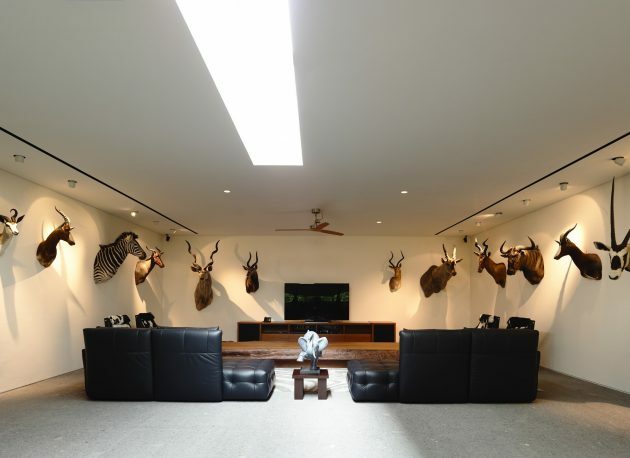 Throughout this home are numerous encounters with nature whilst still being very much indoors. 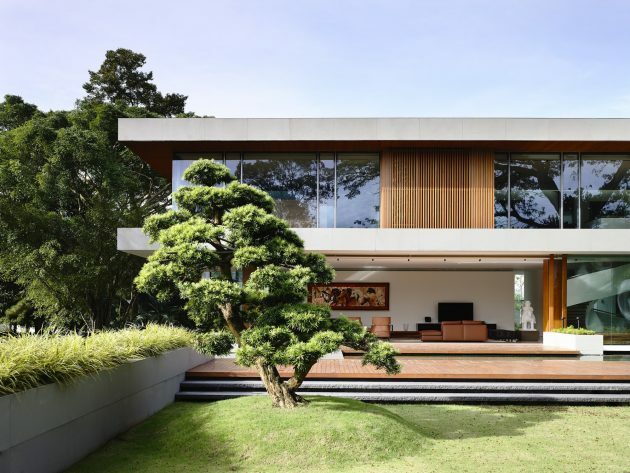 The architectural placement of the building allows for the viewing of the feature tree from all of the main spaces, from either of its two storeys right down to the basement. 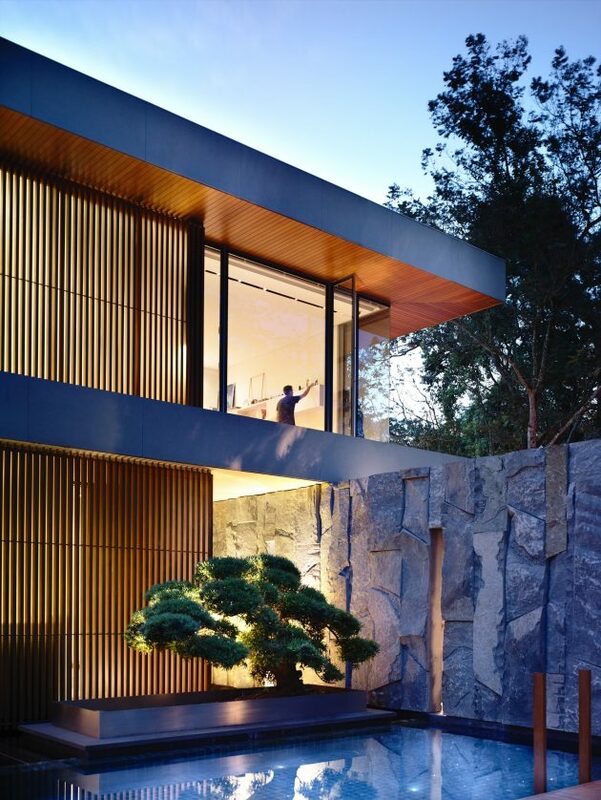 A granite wall at the entrance made from interspersed panels creates a series of holes that subtly shield the garden from full view whilst maintaining a welcoming atmosphere. 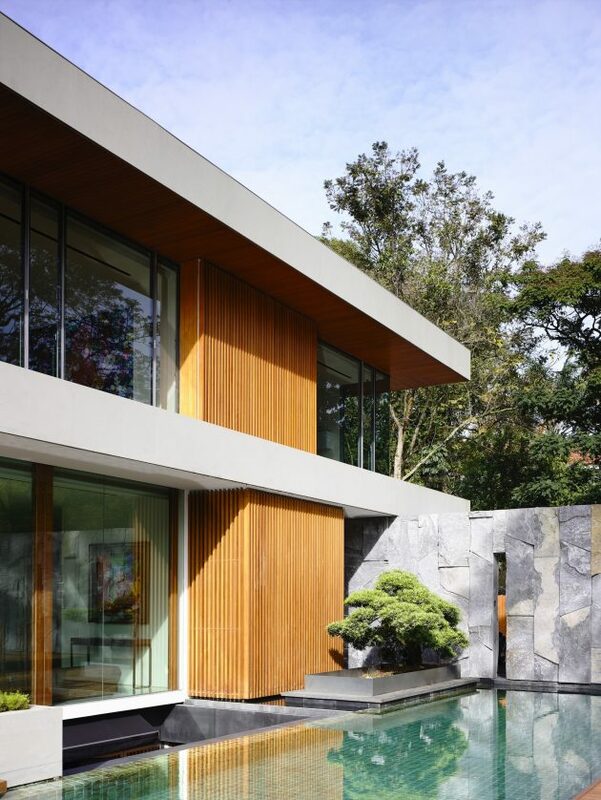 In the driveway, a cleverly placed water feature discreetly hides the sunken air-conditioning ledge just beneath it. 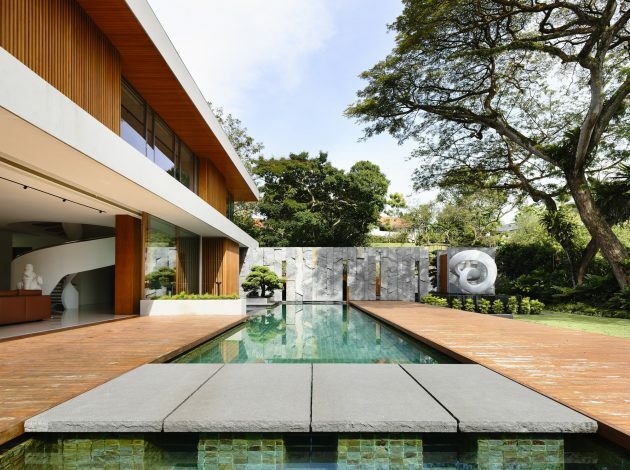 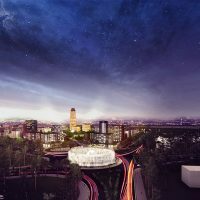 The main living and dining areas are housed on ground level, allowing the spaces to transit seamlessly out into the garden and accompanying lap pool. 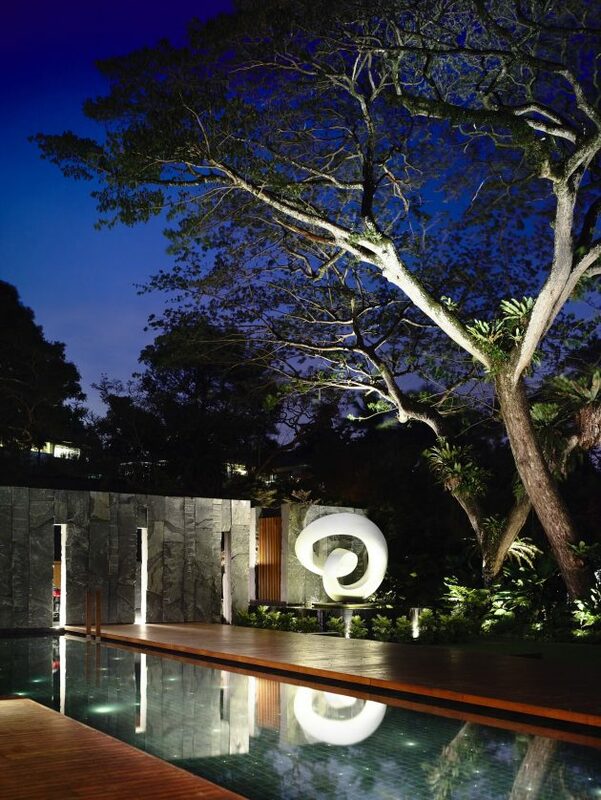 By evening, dots of light on the pool’s base dance playfully in the water, mimicking a starry night scene. 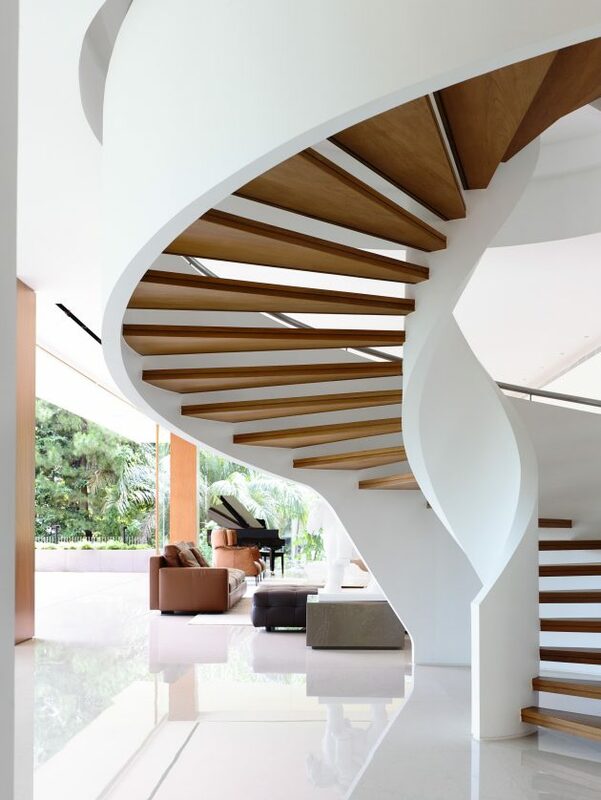 An elegant spiral staircase leading to the upper floor gives the living area a visual centre whilst also promoting vertical circulation. 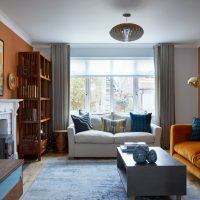 On the second floor sits a cosy family area flanked by bedrooms on either side. 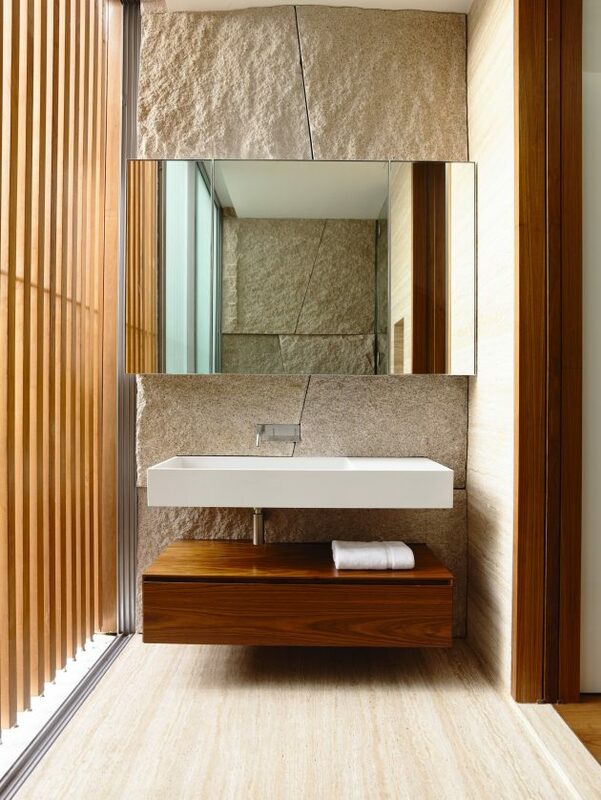 The master bedroom’s spacious interiors allow it to accommodate a study office as well as a walk-in wardrobe that can be expanded by drawing back the partition separating it from the bathroom, thus creating a generously sized boudoir. 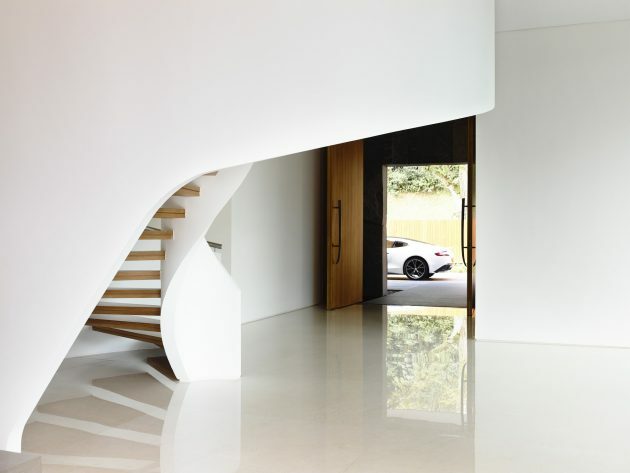 The children’s rooms sit on the opposite side of the floor, each a mirror image of the other. 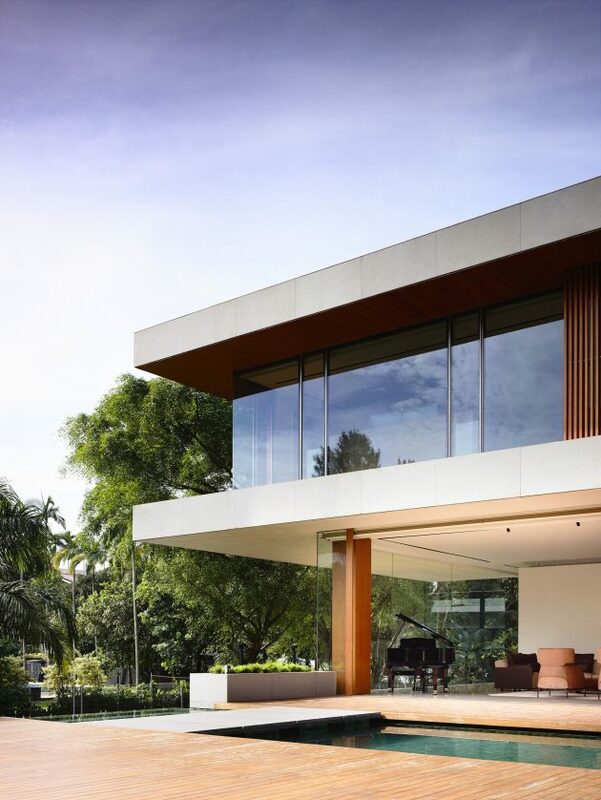 In addition, a glass-covered balcony that spans the entire length of the floor reveals a breathtakingly panoramic view of the aforementioned rain tree. 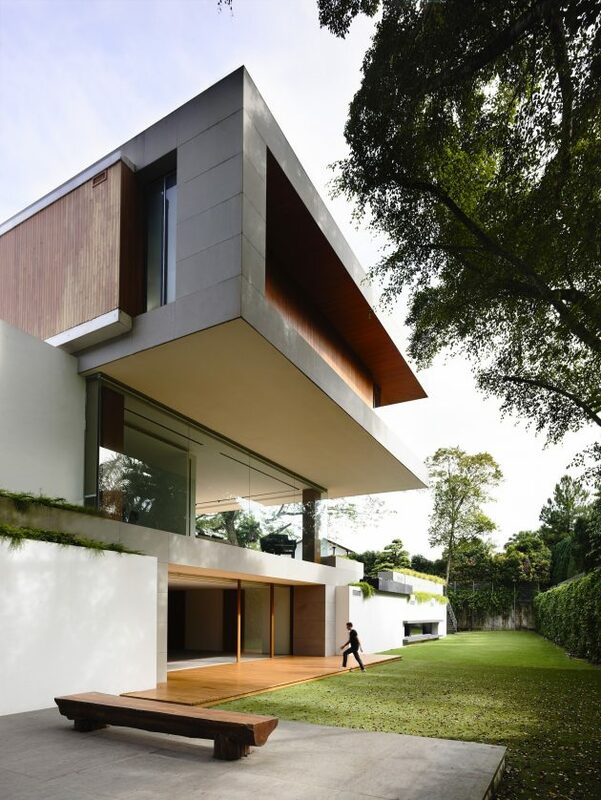 Making good use of the site’s sloping typography, the basement was designed such that it opens up into a lower section of the garden, thus making it feel almost like being on ground level. 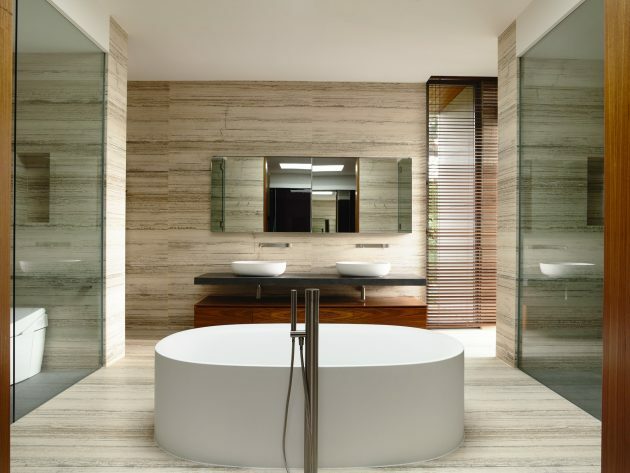 This floor is dedicated to entertainment and relaxation, with a spa room, movie room, large multi-purpose hall, as well as an outdoor barbecue area. 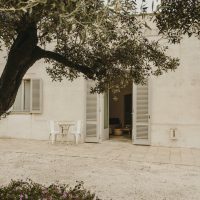 The self-contained service quarters are also kept here, with a mini kitchenette and sleeping quarters to boot. 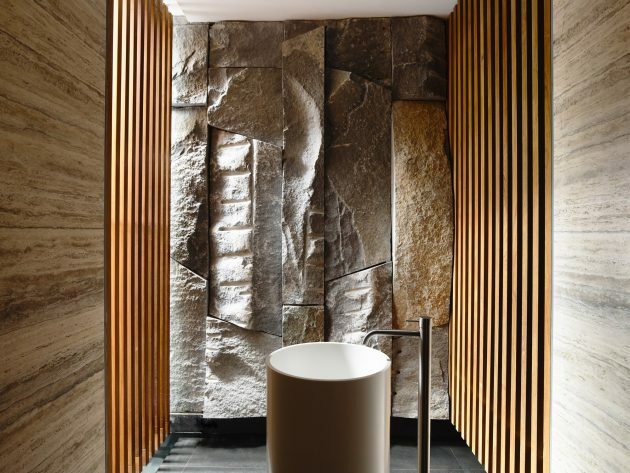 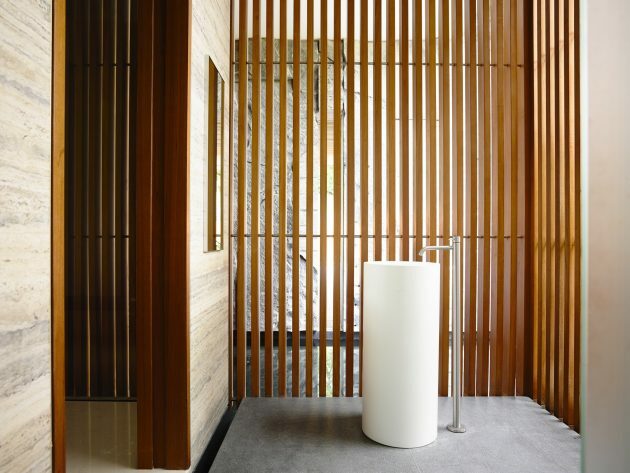 Again, outdoor elements permeate this section of the house by way of a water feature that flows continuously under the powder room and spa room, thus deriving continuity across the various spaces. 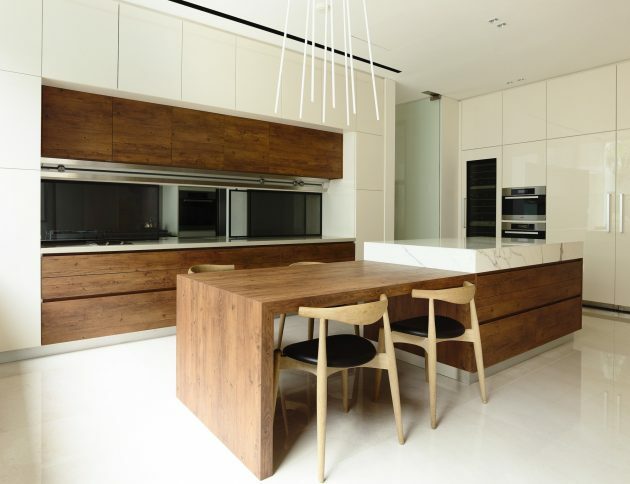 Sensibly placed skylights also help to bring ample sunlight into the spaces and brighten up the basement naturally. 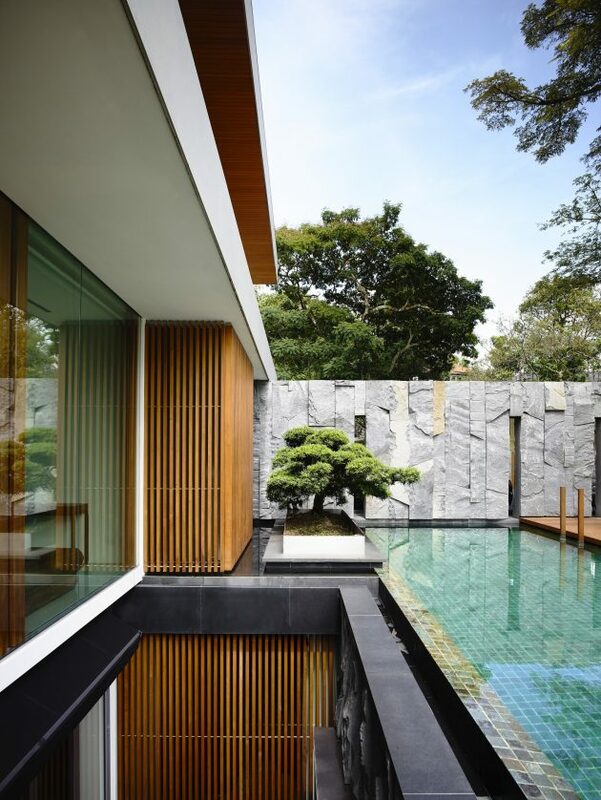 Interestingly, these skylights also provide a spectacularly clear view of the rain tree even from here. 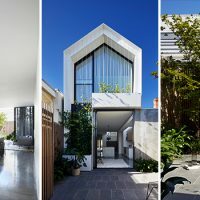 Lovingly designed with a modern, nature-inspired theme, this house is a thing of beauty and a timeless piece that will endure through the ages.